The Chinese Prime Minister Mr. Wen Jiabao is on state visits to both India and Pakistan to grow his country's invesment and trade. He has signed deals worth $16 billion in trade with India, and $35 billion in trade and investment with Pakistan this month. China is now India's largest trade partner, with bilateral trade expected to reach $60 billion during this fiscal year ending March 31, 2011. On Thursday, the two countries set a target for bilateral trade to reach $100 billion by 2015. The bulk of Chinese exports are financed by Chinese banks on attractive terms. And China has invested significantly in many parts of the world including South Asia, more in Pakistan than it has in India. China is Pakistan’s third largest trading partner with $7 billion in trade in 2009, after the United States and the European Union, while Pakistan is China’s largest investment destination and second biggest trade partner in South Asia. Currently, China enjoys two-to-one trade advantage with both South Asian nations, with China exporting twice as much as its imports. This large and growing imbalance stems from the fact that India and Pakistan import high-value manufactured products like power generation and telecom equipment from China, while India's biggest export to China is iron ore, and Pakistan's main export to China is cotton yarn. The Chinese delegation to India and Pakistan was larger than the number in delegations led in recent weeks to India by US President Barack Obama (215), French President Nicolas Sarkozy (more than 60) and British Prime Minister David Cameron (about 40), according to a BBC report. For his Pakistan visit, Mr. Wen was accompanied by dozens of corporate chief executives and 250 business leaders—many of whom were also present during the Chinese leader's visit to India earlier this week, during which he announced economic deals aimed at stabilizing a fragile relationship with New Delhi, according to Wall Street Journal. India and China signed some 50 deals in power, telecommunications, steel, wind energy, food and marine products worth $16bn at the end of a business conference attended by Mr Wen in the capital, Delhi, on Wednesday evening. This overtakes the $10bn of agreements signed between Indian and American businesspeople during the recent visit of US President Barack Obama. In Islamabad, Pakistan, the Chinese Premiere has signed 45 agreements worth $35 billion in just the first two days of his three day visit, approaching the total value ($40 billion) of all of India's agreements signed with China, US, France and Britain during their leaders' recent visits to New Delhi. Pakistan and China Saturday signed 22 new trade agreements, worth $15-billion, aimed at deepening strategic and economic toes between the two countries, officials told media covering the visit. These come on the top of another 13 agreements worth around $20 billion signed Friday after bilateral meetings. The fresh deals were inked at a business summit addressed by Chinese Premier Wen Jiabao and his Pakistani host Prime Minister Yousuf Raza Gilani and attended by business representatives from the two nations. Gilani said that the corporate and business sectors of both countries must now seize business opportunities offered by Pakistan and take the lead. Wen urged the investors from his country to invest in Pakistan and help build the economic ties with the traditional Chinese friend. "We have strong political relations and now we are building economic ties, which can witnessed from the fact that trade has risen from $1 billion in 2000 to $7 billion by 2009," he said. The state-run Pakistan Television (PTV) said the agreements are expected to bring $25 billion in investments and double the bilateral trade to $15 billion by 2015. Through their huge investments in Africa and significant commitments in Afghanistan and Pakistan, the Chinese have shown the extraordinary capacity to see great opportunity where others see large risks. The Chinese know how to do good and do well. They are clearly demonstrating by Mr. Wen's Pakistan visit what they like to call their "all-weather friendship" with Pakistan. The marked shift in focus of this relationship from mostly defense-related deals to broad commerical ties is particularly welcome, given the rise of China as the world's second largest economy after the United States, and a major lender, investor and trading partner of the United States and the European Union. The positive impact of China-Pakistan business relationship will only be achieved by full implementation of these agreements. Let's hope Pakistanis hold their end of the bargain to realize the full potential of economic ties with the world's fastest growing and the second largest economy. High hopes but China is unlikely to be benefficial to Pakistan in the long run.. The FTA with China has all but demolished the nascent white goods and other medium tech industries of Pakistan. One of the few things that can salvage the situation in Pakistan..
its an open secret that the sino-pak axis is a classical balance of power tactic by China for realpolitik gains to limit the india's growing infleunce to the subcontinent. a weak state, with a strong army is the perfect ally for china. and china is expected to milk this situation for its own ends of establishing its presence via a proxy - pak. Chinese Prime Minster Wen Jiabao has praised Pakistan's efforts in the international fight against terrorism. In a speech to Pakistan's parliament, Mr Wen also called on the international community to do more to help Pakistan in its fight against militancy. He spoke two days after a US strategic review of the Afghan war said Pakistan must do more to beat militants. Mr Wen was speaking at the end of a three-day visit to Pakistan aimed at boosting China's main regional ally. China signed deals worth $10bn during the visit. All of Pakistan's ruling and opposition parliamentarians were in attendance as Wen Jiabao took the floor on Sunday. He was quick to lend his voice in support of Pakistan's efforts against militancy. Mr Wen said Pakistan had made immense sacrifices in the international fight against terrorism. He said the country's help had also been instrumental in helping to control the growth of terror. Mr Wen called on the international community to appreciate and support Pakistan in its struggle against this "menace". He said China remained committed to helping Pakistan through troubled times. The Chinese premier's comments appear to be aimed at bolstering support for Pakistan. The country has come under increasing criticism from the West for its alleged support of international Islamic militants. In this context Mr Wen's visit is seen to be of immense importance. The two countries reached several deals in the energy and defence sector worth billions of dollars during the tour. China remains Pakistan's staunchest ally and has often used its international clout to support its perpetually beleaguered friend. Countries have to learn to stand on their own. No country is interested in parasite as their allies. gunam: "No country is interested in parasite as their allies." That is correct, and the Chinese know the value of their alliance with Pakistan better than the Americans, or anyone else! The Pakistanis are expecting nothing short of a miracle to happen to them .... let China do the miracle in Pakistan, if they can ...... ! India has done a good job of not being flooded with cheap Chinese goods, as the Indian consumers have largely rejected substandard cheap Chinese products. It now needs to reduce its trade imbalance with China, to which the Chinese have agreed. The Chinese delegation had already inked trade agreements between the private and public sectors of both countries worth some $30 billion. The trade deals are expected to bring up to $15 billion of desperately needed foreign investment over the next five years to this nation of 180 million struggling to cope with militancy and poverty. Last year, direct foreign investment to Pakistan stood at a 5-year-low of $2 billion. ..
“The timing of the trip is very important. Pakistan is facing difficulties in the region with the Obama review [on Afghanistan] excoriating Pakistan, and Western leaders trooping off to India without visiting Pakistan,” says Mushahid Hussain, an opposition senator and chairman of the Pakistan China Institute think tank. “This trip instills confidence in the Pakistani leadership and the Pakistani nation. Even through these hard times, the world’s second-largest economy is standing with us.”..
Decades of unresolved border disputes after a brief 1962 border war have soured relations between India and China. Contrast that with Pakistan, where China has maintained solid ties for six decades. In 1951, Pakistan was among the first countries to recognize the People’s Republic of China founded two years earlier by the Communist party, which still governs China. Today, China benefits from access to Pakistan’s natural resources, which prompted several bilateral agreements from Wen's trip, including a $400 million loan for post-flood reconstruction, $10 million donation to the flood victims, the widening of the Karokoram highway to facilitate trade, and a pledge to assist Pakistan’s energy sector. If China really wants to help Pakistan it should give 3 billion dollars in Cash . Pakistani domestic economy is very weak . Both in terms of good quality human Technical resources and financial resources. Anon: "If China really wants to help Pakistan it should give 3 billion dollars in Cash." I couldn't disagree more. With Pakistan's corrupt leadrship today, no cash should be given to govt. Chinese are right in their approach to aid in kind rather than with cash under the present conditions. Anon: "So to say 20 Billion dollars will be invested When currently 2 billion are being invested annually is nearly impossible"
This is nonsense! In 2007,Pakistan got over $5 billion in FDI. $20 billion over 5 years is about $4 billion a year. It certainly dwarfs the $10 billion a year in remittances from overseas Pakistanis. Anon: " If Pakistan was so attractive for Chinese investors then they would not have waited for A Prime Ministerial visit"
These things don't happen in day...many of these energy and infrastructure projects have been in gestation for sometime. Wen's visit has simply formalized them. Pakistan has significant natural resources, as well as human capital, in addition to being in a great geostrategic location as transit route for energy and other mineral resources originating from land-locked central Asian nations. Pakistan is also important to China as a strategic ally in South Asia against their common rival India..a country which is being courted by the US and the West as a counterwight against the rise of China. ISLAMABAD, Pakistan — Prime Minister Wen Jiabao of China praised Pakistan’s efforts to combat terrorism and promised to further advance the two countries’ strategic partnership and economic cooperation in a speech to the Parliament on Sunday. Mr. Wen’s remarks came a day after China and Pakistan signed $15 billion worth of trade deals, bringing the total value of the agreements signed during his three-day trip to $30 billion over the next five years. The Pakistani government said the two countries had agreed to widen the Chinese-built Karakoram Highway to facilitate trade, and China said it would give more support in the energy sector. In a joint communiqué, the two countries pledged to cooperate further on security and military issues, energy, transportation, space technology, banking, infrastructure development, heavy machinery manufacturing, cultural exchange and finance. Addressing the Pakistan-China Business Summit in Islamabad on Saturday, Mr. Wen noted that the two countries had trade worth just $1 billion in 2002, but $6.8 billion in 2009. He expressed the desire to expand trade between the two countries, which signed a free-trade agreement in 2006, to $10 billion as soon as possible. Mr. Wen praised Pakistan’s sacrifices in combating terrorism and extremism, words that were in stark contrast to warnings from Washington that Pakistan needed to act more aggressively against insurgents. “Pakistan has paid a heavy price in combating terrorism,” Mr. Wen said. “The fight against terrorism should not be linked with any religion or ethnic group, and there should be no double standards,” he said as lawmakers burst into applause. “The international community should affirm that and give great support, as well as respect the path of development chosen by Pakistan,” he added. The Chinese prime minister made no mention of India, the estranged neighbor of Pakistan. Pakistan sees China as a counterweight to India in the region, and China’s close ties with Pakistan have become a source of growing discontent in New Delhi. The pakistani govenment is increasing taxes and fuel prices frequently . Anon: "What Mushahid Hussain has said is true .This is a confidence boosting visit for the Pakistani people ,THAT IS ALL"
That's all? Is that how you describe $35 billion over 5 years? I think you are being beyond ridiculous. You are insane! Anon: "Pakistan has A 58 billion external debt and A rapidly rising internal debt"
Pakistani economy grew at a fairly impressive rate of 6 percent per year through the first four decades of the nation's existence. In spite of rapid population growth during this period, per capita incomes doubled, inflation remained low and poverty declined from 46% down to 18% by late 1980s, according to eminent Pakistani economist Dr. Ishrat Husain. This healthy economic performance was maintained through several wars and successive civilian and military governments in 1950s, 60s, 70s and 80s until the decade of 1990s, now appropriately remembered as the lost decade. The current $58 billion external debt is quite manageable in a $180 billion economy, if the economy is revived by improving economic management and addtional investments. The focus needs to be on getting the economy growing again at an avg 6% a year...as it has for most of the last 63 years of Pakistan's history. Revival of economy comes out of peace at local. With internal problem how do pakistan expect other countries to invest ? Even expat pakistan would not like to go back to settle in pakistan with the security level is the reality. Politicians [ same across caste, creed, religion ] are looting the country but pakistan has the speciality of muslim fundamentalism which will never attract any sane country to enter into devil paradise. Think of the risk of the whole factory blown away in few seconds. Schools are blown away and how will there be educated people to supply to industry. See the point is PAkistan has no sustainable economic model. Its exports are commoditized contract manufacturing sugar,textiles,cement,textiles etc etc and thus simply not competetive with massive economies of scale that India/China enjoy. What is more there is zero evidence of a sustained policy to create national focus areas which will in 20-30 years create Pakistani industrial comglomorates at par with corporations like L&T,Thermax etc. In spite of all of Pakistan's multiple crises, the nation attracted $2 billion in FDI in 2009-2010 (down from $5 billion in 2007-2008), and its KSE-100 has so far risen 26% from 9386.92 on Dec 31, 2009 to 11,843.65 on Dec 21, 2010. Over the last decade, KSE-100 rose from just over 1000 points at the end of 1999 to 9386.40 on Dec 31, 2009, handily beating Mumbai's Sensex, and other BRIC market indexes by a wide margin. Anon: "See the point is PAkistan has no sustainable economic model." With 75% of its population living on less than $2 a day, 66% defecating in the open, and 70% working in agriculrture and textile with very low productivity (about two-thirds of their counterparts in Pakistan), how will India sustain its economy with all of its massive and growing disaparities? Can the relatively small population of urban middle class Indians (less than a quarter of India's population) live with the continuation of farmers' suicides 200,000 of whom have killed themselves over the last 10 years? Can urban middle class Indians simply ignore and leave behind their world's largest population of poor, hungry and illiterate fellow citizens and hope to compete with the rest of the world? I think not. I think India's highly inequiatable economic model is much less sustainable than Pakistan's. A lack of toilets costs India more than $50 billion a year, mostly through premature deaths and hygiene-related diseases, a study found. Illness, lost productivity and other consequences of fouled water and inadequate sewage treatment trimmed 6.4 percent from India’s gross domestic product in 2006, or the equivalent of $53.8 billion, according to the study by the World Bank’s Water and Sanitation Program. The finding suggests India bears a higher cost than other Asian countries from inadequate collection of human excreta: $48 per person, compared with $9.30 per person in Vietnam, $16.80 in the Philippines, $28.60 in Indonesia and $32.40 in Cambodia, the study’s authors found. More than three-quarters of the premature mortality-related economic losses are due to deaths and diseases in children younger than 5, according to the report. Diarrhea among children younger than 5 years accounts for more than 47 percent of the total health-related economic impacts, the study found. Premature mortality and other health- related impacts of inadequate sanitation were the most costly at $38.5 billion, 72 percent of the total economic burden, followed by productive time lost to access sanitation facilities or sites for defecation at $10.7 billion, or 20 percent, and drinking water-related impacts at $4.2 billion, or 7.8 percent. More than half of India’s 1.17 billion people were mobile- phone subscribers, yet only 366 million people had access to proper sanitation in 2008, a study published in April by the United Nations University, a UN research organ, found. Eighteen percent of India’s urban population and 69 percent of rural dwellers defecated daily in fields, bushes, beaches and other open spaces, according to a March report by the World Health Organization and Unicef. Yes sir living on Charity and having zero focus on industrial development and a feudal agricultural sector is a much more sustainable model than having a competetive industrial and service base and a $300bn FX reserve as a result..You win! Btw China has a higher gini coefficient than India as does the US which means their models are even less sustainable than India's. Anon: "India has a highly competetive industrial base which routinely beats ABB,Siemens etc for industrial contracts in the EU itself.Pakistan...:)"
Pakistan's industrial sector produces everything from autos, steel, tanks, guns, aircraft to chemicals, pharmaceuticals, plastics, fertilzers, household appliances and consumer electronics. Anon: "Btw China has a higher gini coefficient than India as does the US which means their models are even less sustainable than India's." The level of deprivation in India is much higher than China. It's alo higher than Pakistan, and even higher than the nations of sub-Saharan Africa, according to a very recent report by Oxford researchrs. Developed at Oxford University, the Multidimensional Poverty Index (MPI) goes beyond income poverty based on $1.25 or $2 a day income levels. It measures a range of "deprivations" at household levels, such as schooling, nutrition, and access to health, clean water, electricity and sanitation. According to Oxford Poverty and Human Development Initiative (OPHI) country briefings 2010, 55% of Indians and 51% of Pakistanis are poor. Among other South Asian nations, MPI index measures poverty in Bangladesh at 58 per cent and 65 per cent in Nepal. Pakistani industrial base is Nothing as compared to India's Industrial base and strength. i.e India per capita is gonna be 50%+ richer than Pakistan. By 2015 2-3 times nominal per capita at the way Pakistan is growing. Besides Pakistan can forget about US withdrawing in 2011 that means more excitement at least till 2015. China is proceeding with the sale of 2 more civil nuclear plants at Chashma, amidst reports that US will not object. ISLAMABAD: The US will not object to any civil nuclear deal between Pakistan and China if it abides by international rules of such agreements, and chances of the US making such a deal with Pakistan too cannot be ruled out, the American envoy here has said. US Ambassador to Pakistan Cameron Munter said Friday that the US had recently made a civil nuclear deal with India and the chances of such a deal with Pakistan also cannot be ruled out, the Express Tribune reported. Munter made the remarks while talking to media here. Answering a question on the Pakistan's efforts to fight terrorism, he said the US wants Pakistan to launch a military operation in North Waziristan soon. Munter said he would leave it to the Pakistan Army to decide when to launch such an operation. The army has assured the US that they will take action in North Waziristan at the right time. Pakistan has long been under pressure from the US to launch a military offensive in North Waziristan. The foreign office, however, has denied being under US pressure to launch an offensive in the northwestern region which the US calls a "hub of militant activity", saying that the operation will be launched only if it is in Pakistan's "interest", the report said. Last month, the daily reported that the government had authorised army chief General Ashfaq Parvez Kayani to take a final decision on when and how to launch a military operation in the North Waziristan tribal region. A NPP costs $5 bn a pop and the associated infrastructure enrichment/fuel fabrication/reprocessing/waste storeage etc etc etc is a one time investment of $10-20bn. Does Pakistan have this kind of money or does it plan to beg for all this too the way its getting the Chinese NPPs at friendship prices ? Anon: "Does Pakistan have this kind of money or does it plan to beg for all this too the way its getting the Chinese NPPs at friendship prices ?" I appreciate your concern for "poor" Pakistan. To relieve your anxiety, let me just tell you that the two new units, called C3 and C4, will join existing C1 and C2 nukes at Chashma nuclear power complex. Let me also tell you about something called "vendor financing" on attractive terms, which India also gets from Chinese banks for most of Chinese exports to India. If china can give the nuclear reactor with the vendor financing that would be a great boon for pakistan. It will provide necessary power security for the development activity for other players to move in. However the most important aspect for the general movement upwards is the internal security, which pakistan has to provide for itself and to their forthcoming investment partners. For all the naysayers, here is Najam Sethi explaining and breaking down the massive investment bonanza in detail. Please watch all 4 parts. Anon: "Please watch all 4 parts"
While Najam Sethi's skepticism can be healthy, I think his assessment is fundamentally flawed. Just looking at the value of a few infrastructure (Karakram Hwy, Gwadar Port, etc) and energy projets (e.g Chashma, other power plants), the value runs easily into many billions of dollars. As to cash grants to Pak govt, I think such grants only feed graft with people like Zardari in charge. I prefer investments in projects by the Chinese rather than actual cash at the discretion of corrupt Pak officials. And China is not doing it as a favor to Pakistan, it's doing it to promote its own trade and industry and expects a healthy return on its investments. The Chinese are a lot smarter than critics like Najam Sethi, or the Americans whom he prefers over the Chinese. Chinese are worse than shylock and that is the reason, it would be difficult to handle them. Just see, even the usa is not in a position to handle the adamant china compared what it can do with russia. I would say, it is great if pakistan is handling them for their benefit. Yaar since when have Pakistanis been level headed in business or diplomacy?? Their entire record of policymaking be it strategic or economic has hovered around chasing fantasies of magic bullets and one shot wonders which don't exist. Which country has progressed like this? i.e when its own house is on fire some magical foreign investment having saved the day? The Chinese aren't Santa Clauses like Riaz says, if they were what is stopping them from procuring low end goods from Pakistan (shoes,low end textiles etc) for their own massive domestic market to make Pakistan a viable economic state?? The blogger, when he has nothing to say, starts saying again the MPI index, poverty and all of these things. He doesn't mention that inspite of having significant resources ad having such a less population , they are still 51% under poverty. Poverty and hunger are the two main problems of India. The focus of the government should be on these. But Pakistan has poverty, hunger, economic crisis, no food, no textiles, no industry and may more. So don't go on comparing. Try to find out the solutions to these problems. As for the Chinese, its good that They are investing in Pakistan. Yes they are good friends because no other country is investing. But in the long term Pakistan has to stand on its own feet. It cannot depend on Chinese. The Chinese economy is overheating. Its goods are getting expensive due to rise in costs and increasing wages. Chinese invest in India because the vast potential, but they do in Pakistan because its a need to carry on the special relationship. "Import of 263 Non FTA items China withdraws offer "
pakistani electricity and oil sector are having huge debts . The plight of Iraqi Christians occuppy the editorials of Western media during every Christmas, forgetting that the act of war on a soverign state was carried over by Christians and much much more Muslims have been killed in war since then, who are completely ignored by both West and Muslims themselves. India’s foreign exchange reserves at $300 Billion are only a fraction of China’s and those, too, are not based on export earnings but due to inward remittances and fickle inflows of institutional investments in its stock markets. Some analysts, especially Indians, have recently become much more aggressive in their economic forecasts for India and started comparing their country to Tortoise in a race with the Chinese Hare. They have suggested that China has peaked in its growth whereas India is just starting. They claim that India has strong legal and financial institutions which the Chinese lack. They foresee bottlenecks in the growth of China just as India’s potential is beginning to be realized. How far is this a valid hypothesis? India is expected to invest a trillion dollars in its infrastructure and many countries are vying with each other to get a slice of this large pie. This is the reason why leaders of almost all major countries have visited or due to visit India this year. These investments are likely to generate large employment opportunities directly and many more indirectly, in addition to improving economic prospects of regions which are currently not well served by infrastructure. India’s economic growth has been largely based on the domestic market. India’s middle class is booming and is now gradually expanding to smaller towns and even rural areas. The telecom revolution has been real and now covers most villages. Television has reached into the hinterland and raised aspirations of rural masses for the kinds of goods and services that they see being enjoyed by the urban middle class. India largely escaped the recent global recession in part due to the strength displayed by consumers in small towns and villages which were not dependent upon IT and other sectors which are closely tied to the global economy. The rural sector now accounts for half of the two-wheelers sold in India and an increasing number even of small cars. However, a relative lack of growth has led to a serious trade deficit for India, which has so far been filled through capital inflows which cannot be relied upon on a long-term basis. High and rising costs of oil imports of petrol, large infrastructure projects and large-scale defense purchases indicate that these imbalances are likely to worsen rather than improve in the coming years. High and rising costs of oil imports of petrol, large infrastructure projects and large-scale defense purchases indicate that these imbalances are likely to worsen rather than improve in the coming years. This is the case of the Indian economy. FII comes and goes and are not really useful..as a buffer for temporary withdrawl shocks we have $300bn reserves which is worth much more than total FII in India. Otherwise This hurts our exports. So our government is regulating the inflows. anon: "The CHOWK story is BIASED and full of MALICE towards India"
The author Dost Mittar is a patriotic India who is very optimistic about India, and also very fair and balanced in his current assessment of India. Unlike the other three members of the BRIC quartet, India runs huge trade and current account deficits, forcing it rely on remittances and FDI and FII to partially make up the shortfall. India's current situation is not as sustainable as those of China or Brazil both which are running trade surpluses and building large reserves. Take India-China trade for example. India's main export to China is iron ore, and its imports from China are power and telecom equipment, resulting in China's 2:1 trade advatage over India. India's imports from China expanded 19 per cent and stood at US$ 32.49 billion in 2008-09, while exports were at US$ 9.35 billion. India's trade deficit with China is expected to grow larger this year, a trend India considers alarming given the nature of imports that go into India's essential infrastructure of power generation and telecommunications networks. Chinese are now supplying equipment for about 25% of the new generating capacity India is adding to its national grid, up from almost nothing a few years ago. There are thousands of skilled Chinese expatriates at Indian plant sites, along with Chinese chefs, Chinese television and ping pong. India is already the biggest export market for China's two leading telecom equipment manufacturers, Huawei Technologies and ZTE, as both companies have focused on India in recent years. As India has grown to the world's No. 2 mobile phone market in recent years, its imports of Chinese handsets have soared. Exports during August, 2010 were valued at US $ 16644 million (Rs. 77509 crore) which was 22.5 per cent higher in Dollar terms (18.0 per cent higher in Rupee terms) than the level of US $ 13586 million (Rs.65670 crore) during August, 2009. Cumulative value of exports for the period April-August 2010 was US $ 85273 million (Rs 392811 crore) as against US $ 66326 million (Rs. 322424 crore) registering a growth of 28.6 per cent in Dollar terms and 21.8 per cent in Rupee terms over the same period last year. Imports during August, 2010 were valued at US $ 29679 million (Rs.138211 crore) representing a growth of 32.2 per cent in Dollar terms (27.4 per cent in Rupee terms) over the level of imports valued at US $ 22449 million ( Rs. 108506 crore) in August, 2009. Cumulative value of imports for the period April-August, 2010 was US $ 141894 million (Rs. 653828 crore) as against US $ 106605 million (Rs. 518024 crore) registering a growth of 33.1 per cent in Dollar terms and 26.2 per cent in Rupee terms over the same period last year. Oil imports during August, 2010 were valued at US $ 7795 million which was 12.4 per cent higher than oil imports valued at US $ 6936 million in the corresponding period last year. Oil imports during April-August, 2010 were valued at US$ 40736 million which was 31.7 per cent higher than the oil imports of US $ 30929 million in the corresponding period last year. Non-oil imports during August, 2010 were estimated at US $ 21884 million which was 41.1 per cent higher than non-oil imports of US $ 15513 million in August, 2009. Non-oil imports during April - August, 2010 were valued at US$ 101157 million which was 33.7 per cent higher than the level of such imports valued at US$ 75676 million in April - August, 2009. The trade deficit for April - August, 2010 was estimated at US $ 56620 million which was higher than the deficit of US $ 40279 million during April -August, 2009. FAISALABAD, PAKISTAN - The United States has spent billions of aid dollars on Pakistan, but more than nine years after Islamabad joined the global fight against terrorism, the U.S. government remains unable to provide its strategic ally with one thing it really craves: easier access to the U.S. market for its T-shirts, towels and socks. Pakistani leaders have long sought trade concessions from their U.S. counterparts in recognition of Pakistan's efforts to root out insurgent groups on its soil, but the calls for lower tariffs have intensified since this summer's floods, which displaced millions and destroyed much of the country's cotton crop. Lifting tariffs on Pakistan's textile products would undoubtedly boost the country's economy. The textile sector employs nearly 40 percent of Pakistan's industrial labor force and accounts for 60 percent of its exports, and the United States is already one of Pakistan's biggest markets. The House last year passed a narrowly focused bill designed to promote export industries in Afghanistan and specific zones primarily in Pakistan's northwestern border region, but a corresponding bill has been stalled in the Senate. Separately, the U.S. textile industry has made clear it would strongly oppose any legislation that is more ambitious than the bill being considered, saying it would put American jobs at risk. Pakistani officials and business leaders say they understand that U.S. lawmakers have to answer to their constituencies, but they insist that increased bilateral trade would benefit both countries. "We do not want aid. We want trade," said Salamat Ali, chairman of Tauseef Enterprises, a garment company based in this Punjab province city that is home to hundreds of thousands of textile workers and 300,000 power looms. "It's better for America and for other allies if Pakistan stabilizes." Pakistan typically exports about $10 billion of textile products each year, with about a quarter of that amount going to U.S. retailers. Waqar Masood Khan, secretary of the Textile Industry Ministry, said that if the United States and Europe lifted trade restrictions, it would result in a $3 billion increase in exports in the short term. Pakistan succeeded recently in securing trade relief from the European Union, which agreed to waive tariffs on certain textile products from Pakistan for up to three years, starting in January. Pakistanis welcomed the concession but said the waivers, which exclude some finished goods, are unlikely to result in any significant increase in trade. David Trumbull, vice president for international trade at the Boston-based National Textile Association, also said that too often it is the textile industry that has borne the brunt of U.S. trade concessions. But Pakistani textile factory owners say substantial trade relief is essential at a time when their industry is facing all sorts of challenges. Because of security concerns, prospective foreign buyers are reluctant to visit Pakistan. High cotton and polyester prices and general inflation have increased production costs significantly. More crippling, though, are electricity and gas shortages. Some factory owners use more costly generators and wood furnaces to compensate, but many just choose to leave power looms idle and let workers go. "The Christmas and New Year orders are coming now, and this is the time to ship them," said Waheed Khaliq Raamay, owner of a weaving factory in Faisalabad. "Because of the gas shortage, we are losing customers - and we are losing our faith as well." 1.The indian economy is NOT export oriented to the extent China is. 4.Despite poorer infrastructure ROCE figures in indu=ian industry is 50% -80% higher than China thus demonstrating superior capital utilization. anon: "In addition the merchandise trade deficit has begun to decline with export growth outpacing import growth in the most recent survey by commerce ministry ... "
The latet available Commerce ministry figures I just quoted show India's trade deficit growing, not shrinking. Indian imports up 33% vs exports up 28% April 2009-Aug 2010. Take India-China trade for example. India's main export to China is iron ore, and its imports from China are power and telecom equipment, resulting in China's 2:1trade advatage over India. India runs trade surpluses with US and the EU both much more advanced countries/groupings than China so the key issue is Chinese mercantalism not India's lack of competetiveness. As the previous poster says net flow of funds(excluding FII)is strongly positive. If Indian Economic model was unsustainable then first of all Rupee value would crash. Our economy is very sound. One month does not make a trend. As the Indian commerce secretrary says, "If the current trend continues, the country could end-up with a trade deficit of $ 120 billion. “I am not sanguine. One blip on crude prices and my import bill suddenly zooms. On pro-rata basis we are looking at $ 120 billion with a caveat that if oil prices go up, it could be $ 130-135 billion,” Khullar said. Crude oil prices are ruling at $ 87-88 per barrel. There is no point in discussing exports-imports. Yes we Indians have to accept that China is a big economic power and we currently lag behind. But, We should also remember that Chinese economy has started overheating. This is because the economic model which has been great in reducing poverty is unsustainable in the next decade. The Chinese are now encouraging Imports. The Chinese commerce minister had said that we expect a lot of exports from India in future. They want to change the model to a more domestic demand.The Chinese average age will be 37 by 2015, while India's will be 29. MUMBAI: India's current account deficit is being increasingly funded by short-term capital inflows rather than more durable foreign direct investment (FDI), posing a risk to external balance and funding of gap, Goldman Sachs said. "While we remain constructive on India's medium-term growth outlook, the deterioration in external balances represents the biggest risk, in our view, to the Indian growth story, and one that investors should follow very closely," Goldman Sachs wrote in a note on Tuesday. Goldman estimates the current account deficit to widen to 4 per cent of GDP in the current fiscal year, from 2.9 per cent in the previous year, and further to 4.3 per cent in 2011/12, its highest-ever level. "Nearly 80 per cent of the capital inflows are non- FDI related. Given the excess spare capacity globally, FDI may remain weak going forward," the note said. Rising imports due to strong domestic demand and concerns that exports growth may be slow could add to the widening current account gap problem, it said. India's current account deficit widened sharply to $13.7 billion in the June-quarter, which was around 3.7 per cent of GDP. The deficit was $4.5 billion in the same period year ago. India's Planning Commission Deputy Chairman Montek Singh Ahluwalia said last month that the government expects the current account deficit for 2010/11 to be above 3 per cent and the economy can manage a deficit of 3.0-3.5 per cent of GDP. Goldman, however, said India's foreign exchange reserves were adequate to counter temporary reversals of capital. "Yet, the increased reliance on external capital to fund ever-wider current account deficits has increased vulnerability significantly more than before the 2008 crisis," Goldman said. A reversal of capital inflows, in case of an extended period of risk aversion could lead to a sharp sell-off in currency, bonds, equities and cause a liquidity crunch resulting in a sharp decline in output. "We flag this more as a risk, than a clear and present danger," the note said. If you want to make it a discussion based on facts, then is not worth of discussing. The report which you have last quoted does not present a sorry scenario for the Indian economy. Along with the report why also you don't mention that the IMF chief on his recent trip to India has praised India highly on managing capital flows. The basis is that which economic model or which pathway to economy will be the most successful in the long run. The point to mention is that, the Chinese also know that there model is unsustainable and thats why they are trying to change it. They are building there domestic market, which they till have ignored. India's advantages lie here that the state does not much interfere in the economy. So as India's domestic market has already been established, India is trying to increase the exports. The FTP of 2009-2014, targets 3.45% of world trade. The Indian government has already figured out that manufacturing is the core area. But u will also see that India, USA, EU, ASEAN, Latin countries have not taken the Chinese industrial model. The model which the Chinese are also trying to discard it. Manufacturing is the key priority currently. That is why, in the last two years manufacturing has grown faster than services. We have already clinched the position of No.1 in cars export. The focus is now on Consumer durables, electronics. Pakistan can learn from both India & China. Already the FTA with China has destroyed Pakistani Industry. It needs to build up a strong HR and industrial base. Otherwise the only advantage in Pakistan will lie in the war of terrorism. Here's Anil Prasad, the global head of Citigroup's forex and local markets. who believes that foreign investors may be selling Indian equities because they're worried about India's twin deficits. In an interview with CNBC-TV18's Latha Venkatesh, he gave his views on what could possibly be giving foreign investors sleepless nights. Q: What is the FII point of view - are they scared because of Indian valuations, because of possible inflation or because of all the reports of scams? What is the foreign opinion on Indian stocks now? A: Fundamentally, what foreigners are focusing on are two major issues. One is the Indian twin deficit - you have a budget and a current account deficit. Most Asian countries have a current account surplus. While they may have a budget deficit, the budget deficit tends to be much smaller. So you have that one big thing that’s hung over the market all year. In addition, inflation is an issue and it is talked about more and more overseas and clearly the central bank has acted to deal with the inflationary fears but there is a question of have they done enough, does it stall at this level or does it continue to rise. Those are the two big factors on the economic front. On the political front, the scandal sort of makes investors less confident about the transparency and the governance in the system. That, however, is more temporary on the longer term impact. Investors are still cautious. When you give investors real yields of 6-7% and nominal yields of 9% or even in some cases 9.5%, given where developed world yields are that’s very attractive. Q: This twin deficit is not a new story at all. We had a decent amount of FII interest but somehow the worries perhaps have surfaced in the more recent past. Is there anything that’s currently niggling and can probably turn the tide in the last couple of weeks? A: From our analysis, it would appear that for now at least inflation will sort of tapper off as the base case impact starts rolling through. But what really got the market was that we put the sovereign fears in Europe to one side. We said - its okay, things are under control, Greece has been bailed out at least till 2013. Then all of a sudden Ireland happens and when that happened we went back to our old fears. Then you go back and say - but India does have a twin deficit, doesn’t it and while clearly the budget deficit is improving the current account isn’t. The question is, is it funded by the FDI which as you know is less than it was before. Then you are focusing on portfolio inflows. If you are looking at portfolio inflows and the stock market starts coming down then that’s worrisome. Pakistan could also have easily attracted 10 Billion dollars if there were right conditions. So in a way Pakistan is helping India . These FII inflows or outflows. This has been going on for the last decade. This does not mean that India is not a preferred destination. This year may be low, next year will be high. The presidents of USA, France and other countries would not have come to India to sign lucrative contracts if they they believed that India would not be able to fund them in the long run. A decade ago, India economy was at a backward. Still foreigners came back....The ASEAN economies were bankrupt in 1997. Now see their conditions. It all depends that how do you keep on improving the infrastructure and provide the right business environment. The Indian government is expecting a trillion dollar investment in 12th plan. This is because the right infrastructure will provide the right environment for business. It is right that scandals do provide a hitch. But only in the short term. Sooner or later investors realize the potential of the market and the resources. Yes it is right, India is still to improve. But thats what we are doing. The opening up of FDI sectors is the first step. The government is heavily investing in e-governance. This has paid rich dividends. Not only for middle class but for the poor people. The deficit which you have mentioned are because the rate of subsidies had been increasing. Therefore the government is decreasing them. The NPS scheme which has been implemented will be saving Rs. 44,000 crore. Along with this the petrol sector has been deregularised. This will also reduce the deficits. Bubbles burst without a warning, as they have in many parts of the world before. Relying on short-term capital inflows is a recipe for disaster. And the warning signs are there in India now. The FIIs already see the risks. In 2010 so far, Mumbai Sensex is up only 14% while Karachi KSE-100 is up 24%. The BSE benchmark Sensex today recorded second biggest fall in a month by losing over 454 points today on year-end selling by foreign funds in banking and realty sectors, amid rise in food inflation that could signal a possibility of interest rate hike. The Bombay Stock Exchange benchmark Sensex, which had lost 285 points in last two trading sessions, tumbled by 454.12 points to 19,242.36, after dipping to 19,160.87 as financial and realty stocks continued to be battered. On November 16 the index fell 444 points. The National Stock Exchange index Nifty fell by 137.20 points to 5,766.50, after touching the day's low of 5,742.30. Major market players pressed 'panic' button on reports of the deepening crisis over the 2G spectrum allocation scam and food inflation rising to 8.69 per cent from 8.60 per cent for the week ended November 27. Already battered banking and realty segments on hike in deposit rate concerns, fell further as investors felt that food inflation might fuel overall inflation and could lead banking regulator RBI to raise interest rate for the seventh time since March. The reports of Employees Provident Fund suspending further investment in LIC Housing Finance, further fuelled the down-trend in last one-hour trading. The LIC Housing stock tumbled by 7.26 per cent to Rs 894.10. Besides, foreign funds were off-loading on approaching year-ending in the absence of any positive trigger from domestic front and uncertainty in the global economies, especially European. In the 30-BSE index components, 27 stocks declined while three others ended with gains. The consumer durable index was the biggest loser followed by realty, metal and banking. The banking index suffered further losses by falling 3.24 per cent to 12,645.15. State Bank of India, the largest lender, slid for a sixth day to its lowest level in almost four months. HDFC, a mortgage lender, fell 1.85 per cent. Another interest-linked Realty sector index was lower by 4.76 per cent to 2,704.95, on fears that the RBI's policy rate changes might impact the sale of houses and developments. The bubble burst because ASEAN had insufficient foreign reserves and were thus net debtors to the world. India is a net creditor to the world. So where is the short term capital flow here??? Btw out of curiosity what is the comparable situation in PAkistan?? What is the current P/E ratio?? FIIs are showing confidence by further boosting a already high p/e ratio by 14%. It's important to note that Goldman's Jim O'Neill, who coined BRIC, has also talked about big risks to India's growth...bigger than the risks in other three members of the BRIC quartet. O'Neill has said that when he ranked countries by the potential risks to their growth — everything from inflation to corruption — India ranked 97th in the world, behind Brazil and the Philippines. London-based Maplecroft terror risk index based on 2009 data ranks Iraq first, Afghanistan second, with Pakistan and Somalia third and fourth respectively. They are rated at extreme risk along with Lebanon 5, India 6, Algeria 7, Colombia 8 and Thailand 9, according to Reuters. India has a BIG trade deficit a BIG fiscal deficit .That is true. But yet we attract HUGE amounts of investments. and Dozens of World class companies. So there is no SHORTAGE of forex reserves. 1980s styling with 1980s carburater based engine. anon: "Looks like Pakistan's auto industry is going places.... "
While Indians are busy making Nano with a 2-stroke lawn-mower engine, Pakistanis are building the world's largest fleet of CNG vehicle, using domestic CNG kits which are also being exported around the world. Pakistan also has the distinction of having the largest number of CNG stations in the world. "India has done a good job of not being flooded with cheap Chinese goods, as the Indian consumers have largely rejected substandard cheap Chinese products. " Do you have any numbers to prove that? Even West cannot reject Chinese goods, then how can Indians insist on "Made in Germany"? What may make life difficult for China in India is that Indian consumers are brutally cost aware and Chinese will have to compete with Japanese and Americans who make cheaper version of everything in India. Again, when in it comes to Pakistan, you have "Hope". But that is not a good way to analyse. Without social peace, who will get benefits of these Chinese investments, if it materialises at all? Even if fully true, these 35 billion will only be invested over several decades probably, depending on teh progress that Pakistan could make in containing violence. Who would invest in higher end manufacturing in a country if the quality of manpower and institutions are hopeless- those minority who are skilled leave the country and those majority are Madrassa educated and are not suitable for anything that requires a bit of discipline and education?? Rahul: "Pakistanis are building the largest CNG fleet. can you give details. I would like to check it out. Wasn't available on the inetrnet... "
Of the 11.4 million natural-gas vehicles currently in use world-wide, most can be found in the developing world, according the International Association for Natural Gas Vehicles, an industry body. Pakistan led with way with 2.3 million as of December 2009, while Iran, Argentina, Brazil and India together accounted for six million more. In China, the number has more than doubled since 2007 to around half a million. There is a network of 1500 CNG stations in Pakistan to fuel the 2.3 million CNG vehicles. Not only is Pakistan self-sufficient in building cng kits for domestic use, it is also exporting these kits. India is way behind Pakistan in terms of its gas pipeline network, with the neighbouring country’s network stretching around 56,400 km against its 10,500 km, connecting only 20 cities compared to Pakistan’s 1,050, industry body Assocham said. Rahul: "Nothing else. Isnt that too low for a country of about 170 million people... "
85% of Pakistan's exports are manufactured goods, ranking it at #16, vs 79% of India's ranking India at 32, according to Nationmaster. Pakistan's industrial sector accounts for about 24% of GDP. Cotton textile production and apparel manufacturing are Pakistan's largest industries, accounting for about 66% of the merchandise exports and almost 40% of the employed labour force. Other major industries include cement, fertilizer, edible oil, sugar, steel, tobacco, chemicals, machinery, and food processing. Pakistan's exports include textiles, food products, cement, electrical appliances, chemicals, surgical equipment, sports equipment, arms, auto parts, etc. On Wednesday, banks borrowed a record Rs 1.7 lakh crore from RBI. According to a top official working with the Indian Bank, the bank has the plans to target the credit growth to around 28 per cent during the current fiscal year as the demand for the credit this year seems to have risen quite a bit. "We expect a credit growth of 27-28 per cent this year," the Chennai-based bank's Chairman and Managing Director, T M Bhasin, said. "RBI has always been judicious and its decision to decrease the statutory liquidity ratio by 1 per cent will definitely infuse more liquidity in the system," he said. The sustained growth assumptions of India and China at about 10% each are simply not going to happen. Both countries are overheating and there is a not so little constraint called peak oil that will get in the way. Should India maintain its rate of growth, do not expect to see any containment in price inflation. The same holds true for China. India and China are going to overheat and crash, or their economic growth is going to slow dramatically, quite possibly both. Here, is an article which talks about how overly-ambitious was China's Premier's visit to Pakistan. It goes on to say:"...Consider the very, very recent past and the hoax perpetrated by this government about the $35 billion worth of MOUs concluded during the visit of the Chinese prime minister last week. A businessman summoned from Karachi tells a hilarious story of how he and some other businessman were rushed to Islamabad and made to conclude an agreement, the subject of which he has only a faint idea, but enough to know that it was as doable as walking on water. ..."
"Half of the so-called $35-billion deals are about more than doubling our annual trade with China. That’s not only ambitious but absurdly unrealistic." And, "The other half of the $35 billion concerns Chinese investments in infrastructure, and given the instability in the country these are not likely to be invested soon, if at all. " The writer goes on to give another such example of Civilians hyping up numbers to win popularity. Considering the situation that Pakistan is in now, it doesn't come as such a great surprise. Anon: "Absolutely Riaz so RBI should have:1.Prevented the collapse of the USSR.2.Prevented Saddam from invading Kuwait 3.Miracurously lowered international oil prices." It's the regulators' job to anticipate and act to minimize the effects of external and internal shocks. When inflation is already running in double digits as it is now, the regulators need to turn screws tight to reduce credit expansion, and that's not happening in India. In fact credit is expanding, not shrinking in India. When oil prices are rising, the regulators need to reduce non-energy related deficit, but that's not hapening either. When short-term capital inflows are rising and being used to finance deficits, the regulators need to impose controls to prevent havoc that hot money can wreak. How does India fit into this picture? And can two nuclear-armed rivals with a fraught relationship meaningfully engage in trade and commerce with each other? Trade is one of the engines of growth and development but in the case of Pakistan, this potentially important link with India is virtually missing. At present trade is roughly $2 billion a year. Pakistan accounts for less than 1% of India’s trade and India less than 5% of Pakistan’s trade. Contrast this to the bilateral trade relationship following independence, when 70% of Pakistan’s trade was with India while more than 60% of India’s exports went to Pakistan. According to Mohsin Khan of the Peterson Institute, economists estimate a “normal” trading relationship would be five to 10 times larger than the current amount. There is also an estimated $2 billion to $3 billion a year in trade that takes place unofficially through third countries, especially the United Arab Emirates. If this could be normalized as bilateral trade, it would occur at a much lower cost and therefore greater economic gain. I’d argue that we must at least try to improve our economic relationship even if the political relationship is still frosty. The great exemplar here is the European Union, which was built on the premise that binding neighbors together economically was a prerequisite for ensuring peace and prosperity for all. We in India have yet to fully absorb this lesson. A prosperous Pakistan will not only be good for Pakistanis themselves but also good for us in India. It’s time for the liberal commentators on both sides of the border to stop wringing their hands about the demise of a secular liberal democracy, because Pakistan hasn’t been that for some time, if it ever was. While the support that the Indian intelligentsia has offered their counterparts in Pakistan following the assassination is heart-warming, it’s not consequential in the big picture. Liberals in Pakistan may fight on but it’s time for us in India to accept that Pakistan is an Islamic state with Islamic values and laws. The crux here is that trade and commerce know no religious boundaries. We must work towards building a stronger bilateral relationship on that basis. BEIJING: From January to December 2010, Pakistan’s exports to China increased by nearly US $ 500 million and their overall growth rate was 37.4 per cent. According to the figures released by China Customs, the total Pakistani exports to China last year were US $ 1.7 billion compared to US $ 1.2 billion in 2009. Since 2006, Pakistani exports to China has been gradually climbing. The total volume of Pakistan-China trade rose by US $ 2 billion to US $ 8.7 billion approximately. Last year, textiles, ores and mineral products, leather, chemicals and plastics, sports goods, iron and steel, surgical instruments showed the trend of faster growth rates. In 2010, Pakistan’s imports from China also increased by US $ 1.4 billion and the total volume of imports from China stood at US $ 6.9 billion. The trade deficit right now for Pakistan is US $ 5.2 billion. “The two governments have agreed on a series of measures to reduce the trade deficit” said Ambassador Masood Khan on Friday adding that in this regard, China would be sending purchase missions to Pakistan to identify suitable Pakistani products for Chinese markets. He pointed out that Pakistani traders and businessmen will be attending major trade exhibitions in Kunming, Guangzhou, Xi’an, Urumqi, Kashghar, Dalian, and Beijing. Trade seminars would also be held to create greater space for Pakistani products in China. Meanwhile, Pakistan has requested assistance from China in vocational and technical training in the areas of value added textiles, gems and jewelry, ceramics, surgical instruments, leather and light engineering. At the last meeting of the Free Trade Commission (FTC), China agreed to consider the proposal and invite Pakistan to identify specific training needs in these areas. Pakistan has also requested China to give unilateral tariff concessions to 268 Pakistani product lines. Pakistan is the second largest trading partner of China in South Asia. The BBC is reporting that "the budget deficit has reduced to 5.1% of GDP this fiscal year, down from more than 6%. The plan is to cut this to 4.6% next year". Pakistan's budget deficit for first six months of 2010-2011 stood at 2.9%, up from 2.7% last year, according to CNBC and Reuters. KARACHI, Feb 28 (Reuters) - Pakistan's budget deficit for the first six months of the 2010/11 fiscal year (July-June) was 2.9 percent of gross domestic product, the Finance Ministry said on its Web site (www.finance.gov.pk) on Monday. This compared with a deficit of 2.7 percent in the same period last year. In the October-December quarter, the deficit eased to 1.3 percent from 1.6 percent in the preceding quarter. Analysts said the lower second-quarter deficit was largely due to payments by the United States for logistical support provided by Pakistan in the war against Islamist militants. In November 2010, Pakistan agreed with the International Monetary Fund (IMF) that it would keep the country's budget deficit at 4.7 percent for the 2010/11 fiscal year. However, analysts agree Pakistan will likely overshoot this figure. Some forecast the deficit to be around 8 percent, higher than the central bank's prediction of between 6.0 and 6.5 percent, if fiscal reforms are not implemented. The original target of 4 percent was revised following the devastating summer floods, which caused around $10 billion in damages. ISLAMABAD: The Federal Minister for Finance and Economic Affairs, Dr. Abdul Hafeez Shaikh said that no in-action by line ministry (implementation department) would be allowed in the implementation of the decisions agreed between Pakistan and China during the last visit of Chinese Premier to Pakistan. This he said while chairing a meeting with Chinese delegation led by Chinese Ambassador to Pakistan Mr. Liu Jian to review the progress in the implementation of the mechanism for the number of projects in which China has pledged to extend technical and financial assistance to Pakistan. In the post flood Reconstruction Programme, the Chinese Government has pledged to support Pakistan in the reconstruction of a number of projects which included the Grant for Highways and Agriculture, Transport, Energy and Communication, Establishment of China-Pakistan Agricultural Technology Zones, Upgradation of Karakarum Highway and Reallignment of Ataabad Lake, Disaster for Preparedness and Response System and Environment and Ecosystem. The meeting also deliberated upon the progress in the operationalization and implementation of the agriculture related component under the Economic and Technical Cooperation and reviewed the progress in the finance and banking sector, and the members of the meeting were apprised that the ICBC Industrial and Commercial Bank of China is coming to Pakistan to open its branches in Karachi and Islamabad. Meanwhile, the meeting also discussed the opening of Pakistan's National Bank of Pakistan Branch in China under the prevalent procedure in the Chinese Banking laws. Under the bilateral trade, China is to send more trade missions to Pakistan, and Pakistani traders to be given access and free space in trade exhibition in the cities of Kashghar, Urmuqi, Kensing and Chengdu. The Finance Minister asked the concerned officials to give a comprehensive report on the development in this regard. The other subjects which have been discussed in detail are Pakistan's market access by considering grant of unilateral tariff concession to 228 Pakistani products, launch of second phase of the Pak-China Free Trade Agreement, in the first quarter of 2011, the Establishment of Pakistan China Entrepreneurs Forum, and exploring possibility of establishing trans-border economic zones. It may be recalled that during last visit of the Chinese Premier to Pakistan, new air routes between Pakistan and China were also agreed to be opened. The meeting also deliberated upon on airport also. The youth exchange programme was also brought under dicucussion whereby one hundred Chinese and Pakistani youth delegations to visit respective countries to enhance cultural cooperation between the two friendly countries. Both the sides expressed their satisfaction over the pace of progress in the affore mentioned projects and hoped that if there is any laxity from any quarter shall be overcome with collaboration and coordination with the line ministries and corresponding agencies. The United States and Pakistan are becoming increasingly divided over the fight against the Taliban in neighboring Afghanistan. There are strong elements in Pakistani intelligence (ISI) who openly back the Taliban. And there is deep resentment against the United States for drone strikes and attacks against Taliban sanctuaries in Pakistan. Now the Pakistani government is warming up further to China in the hopes of counterbalancing US strength in the region. Pakistan has already invited China to deploy 11,000 troops in their country. A high-ranking Chinese PLA delegation visited the Pakistan-Afghan border last year. At the same time, Pakistan is pushing for the Chinese to become more heavily involved in Afghanistan and they are actively buying Chinese weapons, aircraft and ships. The fate of Pakistan matters not just because of how it will affect the fight against radical Islam. It also matters because Pakistan has nuclear weapons. And China is the source of nuclear reactors for Pakistan. Were Pakistan to move into firmly China’s orbit, it would be a big geopolitical win for Beijing. It would give the Chinese a foothold in the Middle East. It would give Pakistan a protector, with China providing cover much as it already does for North Korea. And we all know how loose the leash is for Kim Jung Il. Hello, but do we really want a nuclear-armed Pakistan where we have little or no influence? The Obama Administration needs to stand tough and firm before we lose Pakistan to China. David Cameron offered Pakistan’s leaders up to £650m ($1,055m) of aid for schools and heaped praise on their “huge fight” against terrorism in a diplomatic gamble to end years of mutual mistrust with a gesture of goodwill. During a confidence-building visit to Islamabad with an entourage of his most senior security advisers, Mr Cameron jettisoned the usual list of UK demands and instead gave Pakistan the benefit of the doubt over Afghanistan and its support for militant groups. Such optimism over Islamabad’s intentions marks a big break in British diplomacy, making a stark contrast with Mr Cameron’s description of Pakistan “looking both ways” on terrorism, a remark that triggered a serious diplomatic incident last year. Rather than regarding Pakistan as a country that “can do more”, particularly on curbing Taliban activities, the British assumption is now that Islamabad’s security agencies have limited control over militant groups they once helped to create. The big test for Mr Cameron is whether his expression of trust can generate better results than the more transactional approach adopted in the past. British officials say they are already seeing tangible improvements in intelligence co-operation and a greater willingness to discuss a political peace deal in Afghanistan. Mr Cameron sought to demonstrate the breadth of the new partnership by offering funds for up to 4m school places by 2015. “I struggle to find a country that’s more in our interest to progress and succeed than Pakistan,” Mr Cameron said after a meeting with Yusuf Raza Gilani, Pakistan’s prime minister. The package of up to £650m, which more than doubles previous education funding, forms part of an aid programme that is set to become Britain’s biggest. The centrepiece of Mr Cameron’s visit was a security round-table with Pakistan’s civilian leadership and General Ashfaq Kayani, its military chief. Sir John Sawers, head of the Secret Intelligence Service, MI6, and General Sir David Richards, chief of the defence staff, also attended, in their second visit to Islamabad in less than a month. Mr Gilani later brushed aside questions over Pakistan’s willingness to combat terrorism. “We’ve the ability and we have the resolve and we are fighting and we’ve paid a very heavy price for that,” he said, citing the 30,000 casualties in Pakistan’s effort to quell an internal insurgency. A Chinese delegation led by Cao Guanging, chairman of the state-owned China Three Gorges Project Corporation (CTGPC), discussed the Kohala, Bunji, Bhasha, Dashu and other hydropower projects in the upper and lower Indus valley during a meeting with Finance Minister Dr Abdul Hafeez Shaikh on Wednesday. Dr Hafeez welcomed the offer and said he would try to develop consensus on issues relating to the projects. He said he would consult with the ministries of water and power and law and justice to sort out legal and other issues. He informed the delegation about the country’s bidding rules and laws and assured it that the bidding process would be held in a transparent manner. He said the Chinese offer had been discussed at a recent meeting of the Economic Coordination Committee of the cabinet. He said the projects identified by the CTGPC would be taken up with it but only after the completion of procedural matters. The Chinese offer to provide financial and technical assistance for hydel and wind power projects, upgrade the transmission system and provide an integrated solution to the problems of power shortage and disruptions was elaborated by the CTGPC delegation at the Aiwan-i-Sadr on Wednesday. Presidential spokesman Farhatullah Babar said in a statement that President Asif Ali Zardari had advised the government to consider tasking the CTGPC with building a run-of-the-river hydro project at Sukkur Barrage and asked Water and Power Minister Syed Naveed Qamar to discuss the project with the sections concerned and prepare a proposal in two months. The president said that agreements with China ensured full security of Chinese investments in Pakistan. He said the true potential of business partnership between entrepreneurs of the two countries had yet to be fully realised. Mr Babar said the CTGPC was already involved in a number power projects in the country and offered to build more to address the problems of power shortage. He said the corporation was currently undertaking Karot, Taunsa, Kohala and Bunji hydro-electric power projects. A letter of intent for the 720MW Karot project has been issued after the approval of its feasibility study. The project is currently at the tariff petition stage. A memorandum of understanding for the 120MW Taunsa hydro-eclectic project has been signed and a development agreement will be signed this month. Mr Babar said the 1,100MW Kohala project was ready for tariff negotiations. A letter of intent for the project has already been issued after the approval of its updated feasibility study. The 7,100MW Bunji project is ready for site survey. The MoU for the project was signed in August 2009. Mr Babar said that wind power projects, including Sindh’s first and second wind farms and Punjab’s wind and solar projects, were also in an advanced stage. In December, the two countries agreed to increase bilateral trade to $100bn (£66bn) by 2015, up from $60bn in 2010. Mr Singh will also attend a summit in China that will include Brazil, Russia, India, China and South Africa. China is India's largest trading partner. However, the two countries still share a very unbalanced trade relationship. "India's import dependence on China has gone up significantly on critical items," said Samiran Chakraborty, regional head of research for India at Standard Chartered Bank. "Whereas if you look at exports, India's primary export to China is only iron ore."
Mr Chakraborty says this issue could come up during the visit. "One of the demands is to open up the Chinese markets to India. Otherwise the trade balance is very much in favour of China and working against India," he adds. When China's Prime Minister Wen Jiabao visited India in December, the two sides agreed to take measures to promote Indian exports in China, in an effort to reduce India's trade deficit. About 400 business leaders came with Mr Wen to India and business deals worth $16bn were signed. The two countries also agreed to expand co-operation in infrastructure, environment, information technology, telecommunications, and investment and finance. Mr Chakraborty says it is in each sides interest to continue to deepen ties. "If these two have to stay side by side sharing borders and trying to grow at high growth rates it has to be a complimentary relationship rather then a tense relationship," Mr Chakraborty said. "Otherwise it will impact the investment climate in both countries". ISLAMABAD (APP) - President Asif Ali Zardari on Friday inaugurated two branches of Industrial and Commercial Bank of China (ICBC) here at a ceremony at Aiwan-e-Sadr. President ICBC Yang Kaisheng and senior management of the team were present at the ceremony. Speaking on the occasion, President Zardari said the initiative taken by the Industrial and Commercial Bank of China by opening its branches in Islamabad and Karachi, would begin a new era of cooperation in the banking sector of the two countries. The opening of ICBC branches will take the economic relations between the two countries to new heights, he added. The President said that the opening of ICBC branches coincided with the anniversary of 60 years of diplomatic relations of Pakistan and China. The President said by opening bank in Pakistan, Chinese have shown confidence in the financial sector of Pakistan. He said when the world was passing through a difficult economic phase and the investors were not readily coming forward to make investments, the initiative taken by ICBC was most commendable. The President hoped that ICBC's investment in Pakistan would prove to be profitable and the bank would play a prominent role in channelizing bilateral investments. The President said the government and State Bank would extend every possible assistance to facilitate ICBC operations in Pakistan. Appreciating tremendous economic progress of China, the President said since becoming President he had visited China six times in order to learn from the Chinese experience of development. "There is so much to learn from the Chinese experience," he remarked. The President said Pakistan has offered to set up special Chinese investment zones in Pakistan where special tax concessions will be offered. With captive power, tax concessions, low cost labor and access to a huge market the Chinese investors will find Pakistan most profitable place for investment, the President added. At a sprawling manufacturing complex here, hundreds of Chinese laborers are now completing work on the San Francisco-Oakland Bay Bridge. Next month, the last four of more than two dozen giant steel modules — each with a roadbed segment about half the size of a football field — will be loaded onto a huge ship and transported 6,500 miles to Oakland. There, they will be assembled to fit into the eastern span of the new Bay Bridge. The project is part of China’s continual move up the global economic value chain — from cheap toys to Apple iPads to commercial jetliners — as it aims to become the world’s civil engineer. The assembly work in California, and the pouring of the concrete road surface, will be done by Americans. But construction of the bridge decks and the materials that went into them are a Made in China affair. California officials say the state saved hundreds of millions of dollars by turning to China. On the reputation of showcase projects like Beijing’s Olympic-size airport terminal and the mammoth hydroelectric Three Gorges Dam, Chinese companies have been hired to build copper mines in the Congo, high-speed rail lines in Brazil and huge apartment complexes in Saudi Arabia. In New York City alone, Chinese companies have won contracts to help renovate the subway system, refurbish the Alexander Hamilton Bridge over the Harlem River and build a new Metro-North train platform near Yankee Stadium. As with the Bay Bridge, American union labor would carry out most of the work done on United States soil. American steelworker unions have disparaged the Bay Bridge contract by accusing the state of California of sending good jobs overseas and settling for what they deride as poor-quality Chinese steel. Industry groups in the United States and other countries have raised questions about the safety and quality of Chinese workmanship on such projects. Indeed, China has had quality control problems ranging from tainted milk to poorly built schools. But executives and officials who have awarded the various Chinese contracts say their audits have convinced them of the projects’ engineering integrity. And they note that with the full financial force of the Chinese government behind its infrastructure companies, the monumental scale of the work, and the prices bid, are hard for private industry elsewhere to beat. California authorities say they had little choice but to rebuild major sections of the bridge, despite repairs made after the earthquake caused a section of the eastern span to collapse onto the lower deck. Seismic safety testing persuaded the state that much of the bridge needed to be overhauled and made more quake-resistant. Zubair Motiwala quoted in the WSJ story today is denying on GeoTV that Kingho has made a final decision to pull out of part of Thar coal project worth about $3 billion, not the $19 billion reported by WSJ. Motiwala says negotiations are still underway with Kingho to deal with some the issues of tariffs, security and other guarantees raised in discussions with them. He also pointed that an MOU for a much bigger deal has just been signed with Global Mining Corporation, another Chinese co, worth closer to $20 billion for a number of projects related to Thar coal, including a power plant that will generate uo to 10,000 MW of electricity when completed. China has showered goodies on Pakistan as its top diplomat Dai Bingguo is visiting Islamabad, complains Times of India. China has offered Pakistani companies tax free status if they operate in the border province of Xinjiang while ICBC, the Chinese bank, is working on ways to finance the Iran-Pakistan oil pipeline project. In Islamabad, Dai appealed to world powers to support Pakistan and not desert it at this time. Pakistan has considerable influence on Afghanistan, which must be taken into consideration by those trying to resolve the crisis in Kabul, he suggested after meeting Pakistani president Asif Ali Zardari and prime minister Yousuf Raza Gilani. The taxation move suggests China is serious about building a rail line connecting Pakistan and is preparing the economic infrastructure to support it. The new rule unveiled on Saturday offers a 5-year tax exemption to companies operating in Kashgar, which borders Pakistan and Horgos on the Chinese border with Kazakhstan. Beijing had earlier announced to build a logistics centre in Kashgar, which saw bloody ethnic riots earlier this year, to revive the local economy and divert attention of the minority Muslim community from separatist leaders fighting to build an independent East Turkmenistan nation. Pakistan recently announced that the Industrial and Commercial Bank of China, the largest of Chinese banks, has been appointed as the main financier in a consortium that will finance the $1.2 billion Iran-Pakistan gas pipeline. Beijing's hand is clearly visible in the decision because the project is based on the assumption of a politically stable Pakistan, which is not the case at present. China, which has already invested $200 million to build the Gadwar port in Pakistan and helped the country build two nuclear power projects, is betting on the ability of the Zardari government to ensure stability by mending fences with the country's military leadership. Pakistan and China on Friday signed six bilateral agreements including a Currency Swap Agreement to further bolster their existing trade and economic co-operation. The agreements worth over US $700 million were signed between the two sides at a ceremony held here at the PM House and was also witnessed by Prime Minister Syed Yusuf Raza Gilani and State Councillor of China Dai Bingguo. The Supplementary Agreement on Extension of Five Year Development Programme on Trade and Economic Co-operation between the two countries was signed by Secretary Economic Affairs Division, Wajid Rana and Vice Minister of the Chinese Ministry of Commerce, Li Jinzao on behalf of their respective governments. The Inter-Governmental Framework Agreement on Additional Financing for Improvement of KKH ($90 million) between the two countries was also signed by Wajid Rana and Li Jinzao. The Currency Swap Agreement was signed by Governor State Bank of Pakistan, Yaseen Anwar and Vice Governor of the People's Bank of China, Du Jinfu. The Concessional Loan Agreement on Additional Financing for Improvement of KKH ($90 million) between the Economic Affairs Division (EAD) and the Export-Import Bank (EXIM Bank) of China was signed by Secretary EAD, Wajid Rana and the Vice Governor of EXIM Bank, Sun Ping. The Loan Agreement on Provision of $259 million Preferential Buyer's Credit for KKH (Karakorum Highway) Realignment at Attabad between EAD and the EXIM Bank of China was also signed by Wajid Rana and Sun Ping. The Loan Agreement on Export Credit Facility of $464 million for Power Plant between Guddu Power Company and EXIM Bank of China was signed by CEO Central Power Generation Company Limited (GENCO- II), Aslam Sheikh and the Vice Governor of China's EXIM Bank, Sun Ping. China has emerged as Pakistan’s largest trading partner replacing the US and is being closely followed by the UAE. The US has slipped to third position on the list of the top ten trading partners. Germany and the UK occupy eighth and 10th slots respectively and Japan is no more on the ten top list. The latest rankings based on the FY11 statistics indicate that Pakistan is doing much more trade within Asia and its reliance on American and European markets is on the decline. Emergence of the new rich in China and expansion in middle-income consumers in the Middle Eastearn countries opened up new opportunities for Pakistan to boost trade with all these nations. Moreover, the trade gravity played its part in redirecting our external trade towards South and East Asia including Malaysia and Indonesia. Small wonder then, that in the last fiscal year seven out of the top ten largest trading partners of Pakistan were all Asians—China, the UAE, Saudi Arabia, Kuwait, Malaysia, Afghanistan and India. And all of them except Saudi Arabia and India showed an improvement in their respective rankings, in a small span of three years. “Interestingly whereas recession in the US and troubled political relationship between Islamabad and Washington affected growth of bilateral trade, the surge in the US troops in Kabul aimed at winding up the military operation there increased our exports to Afghanistan,” according to a senior official of Trade Development Authority of Pakistan (TDAP). That explains, at least in part, why Afghanistan’s seventh slot among our largest trading partners in FY11. Business leaders say Pakistan’s top bilateral trade partners are changing not just because of economic miracle of China and overall better average economic growth in Asia than in America and in Europe. “Increase in imports from China, for example, is also related to the Chinese investment projects in Pakistan part of which are scaling down American influence,” said a former president of the Federation of Pakistan Chambers of Commerce and Industry. India and China are two of the six countries on the list of the top ten trading partners with whom Pakistan runs trade deficits. The other four are the UAE, Saudi Arabia, Kuwait and Malaysia. Whereas Pakistan imports large amounts of costly fuel oil from the first three countries, it runs trade deficit with Malaysia primarily due to huge import bills of palm oil. With four countries out of the ten largest trading partners, Pakistan boasts of a trade surplus. These are the US, Afghanistan, Germany and the UK. “Whereas it is easier to retain Afghanistan as a major export market and it is encouraging that Bangladesh has emerged as a billion-dollar market for our products, the US, Germany, the UK and other European countries are equally important for sustained growth in overall exports,” remarked chairman of Pakistan Bedwear Exporters Association Mr. Shabbir Ahmad. He and many other exporters believe that normalisation of political relationship with the US and continuing of efforts to win trade concessions in European Union are required for keeping exports on a high growth trajectory. Anil Ambani’s Reliance Communications has been saved from a potential financing crunch by a surprise US$1.1bn loan from a group of Chinese state-owned banks. RComm will use the new funds to repay a US$1.2bn convertible bond issue due for redemption on March 1, putting an end to fears of a potentially devastating default. The loan has raised eyebrows as a rare instance of Chinese support for one of India’s biggest business groups. China Development Bank, Export-Import Bank of China, Industrial and Commercial Bank of China and other Chinese lenders provided the entire refinancing, according to an announcement from RComm on January 17. RComm “will benefit from an extended loan maturity of seven years and attractive interest cost of about 5%”, said a company press release. The new loan comes as European banks – RComm’s traditional relationship lenders – are scaling back exposure to Indian borrowers. RComm has taken a hit from India’s ongoing telecoms corruption scandal, with police questioning chairman Anil Ambani last year, and its existing syndicated loans feature prominently on axe sheets in circulation from European banks. However, bankers with direct knowledge of the matter said that, in return for the loan from the Chinese policy banks, RComm was expected to purchase equipment from the country’s PC companies, such as Huawei and ZTE Corp. This is not the first instance of such an arrangement. Late last November, Sasan Power, the project company for the Sasan ultra mega power plant and a subsidiary of RComm affiliate Reliance Power, completed a US$2.2bn refinancing, including a US$1.114bn 13-year tranche. Bank of China, CDB and Chexim took US$1.06bn of that tranche, for which Chinese export credit agency Sinosure provided cover. That was the first Indian loan to which Chinese lenders had committed such large amounts, after they began to take lead roles on Indian deals in 2007. Prior to Sasan Power, the take of Chinese lenders as MLAs on Indian deals amounted to just US$218.26m from six transactions in three years. Bankers warned, however, that the Chinese loan was unlikely to provide a template for other Indian companies to follow. “The names that have trade links with the PRC will appeal more to the Chinese banks. Those that think they can meet the criteria are being marketed to the Chinese banks,” said a banker with a foreign bank in Mumbai. More than two dozen Indian companies in the BSE-500 index face redemptions on foreign currency convertible bonds worth a combined Rs330bn (US$6.5bn) at end-March 2013, according to brokerage Edelweiss. These include RComm’s US$925m outstanding CB, which the loan will repay. Entities without ties to China must look elsewhere and may have to rely on Indian banks to overcome their refinancing pressure. Reliance Communications Ltd. opened a window this week. India's second-largest mobile phone carrier by number of subscribers was under pressure to refinance $1.18 billion of foreign-currency convertible bonds. In the current market, that looked like a stiff challenge, as lenders in the U.S. and Europe struggle with their deteriorating economies. Enter a consortium of Chinese banks to bail out the Indian company with a loan paying just 5%. The deal gives the banks the sort of exposure to India's fast-growing communications space that Chinese companies couldn't get otherwise. New Delhi routinely blocks Chinese business seeking a piece of India's strategic industries such as telecommunications, technology or energy. The government typically cites quality-control issues or national security, though political posturing is perhaps a more likely cause. Yet the Reliance loan deal puts the Chinese banks in a strong position over a prominent Indian business. It might also help China Inc. get more leverage in the Indian economy. Still, politics shouldn't cloud the positives for India. The deal is a savior for Reliance, whose share price is nearly 87% below the conversion price set on the bonds four years ago. Moreover, the loan means China, through its state-owned banks, now has a significant stake in the success of an Indian telecommunications giant. Beyond Reliance, a host of Indian companies are in need of capital this year to fulfill expansion plans or repay debt. But traditional funding channels are drying up, local markets are jittery and interest rates are by no means cheap. Under those circumstances, more Chinese money may find a warm welcome in India. China’s state-owned Three Gorges Corp. plans to invest $10 billion by 2018 in Pakistan’s energy sector and a delegation is scheduled to visit Pakistan on February 7, officials said on Friday. The Hong Kong-based United Energy Group Limited of China also intends to establish a 2,000 megawatts power project in Sindh as their delegation is also visiting Pakistan next month to hold further talks on setting up the power projects, they said. Sindh Coal and Energy Department has signed memorandums of understating (MoU) with the two companies, which have shown interest in developing coal-fired power plants in Thar and Badin coal fields, as well, the officials said. In an attempt to resolve the issue, the government is pinning hopes on Thar Underground Coal Gasification (UCG) pilot project, which contains the country’s largest coal deposits of around 850 trillion cubic feet spanning over 3,800 square miles, they said. Overall, according to the World Energy Council, Pakistan has slightly more than 2,000 million tons of proven recoverable coal reserves. Pakistan’s current electricity demand is around 25,000 megawatts per day, but the current electrical production is less than 20,000 megawatts per day, leaving a deficit of slightly more than 5,000 megawatts, and by 2015, domestic demand is projected to rise to 30,000 megawatts per day. Currently, the country depends on oil and natural gas to generate up to 60 percent of its electricity needs, further impacting the country’s balance of payments as the price of oil rises and the ongoing power shortages are beginning to impact the country’s bottom-line exports, the officials said. Member of the Science and Technology Planning Commission, Dr Samar Mubarakmand, has said that Thar coal project would be beneficial for common people and free from all defects. The success of the Thar coal project would lead to investment from leading international companies, he said. With the completion of coal-fired power generation project, the nation would get cheap and sufficient power supply, which would resolve the current energy crisis, he added. Mubarakmand said that the country had enough coal reserves through which it could daily produce 50-60 million cubic feet gasifier, which would end gas shortage from the country. It is for the first time that the coal gasification is being launched on commercial basis, which will help in abundant and cheap electricity. China is shelling out massive amounts of money and manpower to improve Pakistan's Karakoram Highway, the highest motorway in the world. The supposed gift to its neighbor is a perfect example of China's economic strategy of taking on short-term expenses for the sake of long-term benefits. The road roller struggles up the mountain, tar steaming in the heat. Several Chinese and Pakistani workers stand there, leaning on their shovels and observing how their boss, Mr. Li, operates the yellow machine. A few meters on, he stops and jumps out on the unpaved side of the road, directly before a chasm about 1,000-meters (3,300-feet) deep. Seemingly unfazed by the elevation, he nods to his workers and calls out: "That's how it's done. Any questions?" Whether its high-rises, ports or streets, China is building -- worldwide and on a grand scale. The expansion of the famed Karakoram Highway from China to Pakistan, a part of the Silk Road trade routes, is just one of China's massive construction projects and an example of Beijing's strategy for the future -- investing a lot and giving generously in exchange for long-term benefits. The almost 1,300-kilometer (800-mile) long path, which runs from Kashgar in western China's Uighur Autonomous Region almost to the Pakistani capital Islamabad, is set to be transformed from a dusty, bumpy road into a modern mountain highway. The section on the Chinese side is already finished. "For Beijing, it's about being able to export more goods to Pakistan, through the ports of Karachi and around the world," says China expert Fazal ur-Rehman of the Institute of Strategic Studies in Islamabad. Plans also include a future pipeline that runs along the Karakoram Highway, allowing China to bring in Iranian gas. The Chinese have summarily decided to drill a tunnel to bypass the newly created Attabad Lake, now a tourist attraction. "It will now take another few years," says Li. Undeterred by the challenge, the Chinese hauled in heavy equipment. And where bricks were needed to protect the road with walls against landslides or falling rocks, brickworks were swiftly built on site. "Where protective walls were of no use, we built a tunnel," says Li. Kilometer by kilometer, a monument to Chinese foreign economic policy is being erected. Beijing doesn't worry about the short-term rates of return for its building projects abroad, but on the long-term trade options that they open up instead. The country is also interested in gaining allies with its generous help. In many countries besides Pakistan, Chinese engineers are working on key infrastructure projects. And often the Chinese are also investing in exactly the places from which the West has long since retreated -- such as many African countries rich in natural resources. Pakistan is China’s Number 1 ally and the most special country for China. These were the words of Prof Feng Zhongping, President, China Institute of Contemporary International Relations (CICIR), as he addressed members of the Pakistan Institute of International Affairs (PIIA) at the institute Tuesday morning. The occasion was the visit by a five-member delegation of the CICIR who had an interactive discussion with a compact group of PIIA members and journalists. Chairperson of the institute, Dr Masooma Hassan, presided over the proceedings. “Our ties with Pakistan”, Zhongping said, “are historic and as such we treat Pakistan as a very special country”. Pakistan, he said, had a geo-strategic location which was of pivotal importance to China. He said that Pakistan was an old friend of China and added that China had a history of never letting her friends down. Pakistan’s population of 180 million was of great consequence to China, he said. Another member of the delegation, citing the importance of Pak-China ties, pointed out that it was Pakistan that helped open up China to the world by starting off an air service between the two countries and cited Pakistan’s efforts in bringing the US and China closer. Pakistan’s location, Zhongping said, was very important as access to the Indian Ocean would make China a two-ocean power, with the Indian Ocean to one side and the Pacific to the other which would benefit the country greatly in light of her rapidly expanding trade with the world. ISLAMABAD: Chinese investment in the Gwadar Port is purely economic, said Hu Xijin Editor-in-Chief of the Global Times on Wednesday. Speaking at a roundtable organised by the Institute of Regional Studies (IRS) on Pak-China relations with the editorial staff of Global Times he siad China would make all the necessary investments in the Port to make it fully operational to support Chinese trade with West Asia, especially the trade between western part of China and that part of the world. China considers Pakistan an important friendly neighboring country and Chinese investors want to invest in projects in Pakistan. Some Chinese investors are apprehensive about the security situation in Pakistan. He said China would keep supporting the reconstruction of Afghanistan post-2014. China does not want to undertake projects in any country that are opposed by the host communities. Responding to a question about the imbalance in trade of China with Pakistan, Hu said China was a free market economy where the government could not dictate to the companies to import products from other countries if they were not market competitive. Ashraf Azim President of IRS pointed out Indian concerns about the use of Gwadar Port, as a naval base was completely baseless. Friday, March 29, 2013 - Islamabad—China is committed to invest heavily in Pakistan’s energy and other sectors to improve lives of people, Deputy Chief of Mission of the Chinese Embassy Yao Wen said Thursday. Speaking at a function at a local school here, Yao Wen said Chinese are already working on 120 projects in Pakistan with around a quarter related to energy. In addition, during the last five years volume of bilateral trade has grown by 70 per cent to over $ 12 billion with Pakistani exports increased two-fold from $1 billion to $2.2 billion, he informed. Yao Wen stressed the need for enhancing collaboration between educational institutions and exchanges of students and researchers to promote intellectual cooperation. Lauding the role of Pakistan in regional and global peace, stability and development, he said that Pakistan has offered great sacrifices to ensure peace. Speaking on the occasion, President Ex-Chinese Association Raza Khan lauded the Chinese assistance and cooperation in various fields, terming it a great service to people of Pakistan. He lauded the active involvement of Chinese Ambassador Liu Jian in capacity building of students and said that supporting needy students was a great service for social development. Raza Khan stressed the need for increasing people-to-people exchanges to promote understanding and carry forward cause of Pak-China friendship. Terming China a sincere friend, Joint Secretary Ministry of Education Prof. Muhammad Rafiq Tahir said that two countries should fully unleash their potential of cooperation to benefit masses. Mary Kay Magistad of NPR's The World reported that China has reacted strongly to the Pentagon report on China's military growth and modernization with its first aircraft carrier, several nuclear submarines and stealth aircraft. Magistead reported that Xinhua has for the first time talked about China as a global economic power with global interests and it needs a blue water navy to protect a tremendous number of sea-lanes. In order to deepen the China-Pakistan strategic cooperative partnership, Li proposed, the two neighbors should firstly strengthen strategic communication and coordination, maintain high-level contact, and thus steer the bilateral relationship forward. Secondly, the two countries should reinforce strategic and long-term planning, and open up new cooperation areas such as connectivity and maritime sectors, the Chinese premier said. They should start formulating a long-term plan for the China-Pakistan economic corridor project and gradually push forward its construction, added the premier. Thirdly, Li suggested, China and Pakistan further raise the level of bilateral trade and realize a dynamic balance while expanding the scale of two-way trade. China, he said, encourages Chinese enterprises to participate in Pakistan's infrastructure construction. Fourthly, the two sides should boost people-to-people and cultural exchanges and media cooperation, said the Chinese premier, adding that they also need to expand exchanges between their young generations so as to carry forward their traditional friendship. Fifthly, he urged the two countries to promote cooperation in regional and global affairs and safeguard the common interests of developing countries. China respects the development path Pakistan has chosen based on its own realities, and will continue to support Pakistan in defending its independence, sovereignty and territorial integrity, Li said. China, he added, is willing to provide unconditional help within its capacity for Pakistan's economic development and seek common advancement in state governance through exchanges and mutual learning. China has committed $6.5 billion to finance the construction of a major nuclear power project in Pakistan's port city of Karachi as it seeks to strengthen ties with its strategic partner, Pakistani officials said. Two members of the government's energy team and three sources close to the deal confirmed this. CNNC was not available for comment. "China has complete confidence in Pakistan's capacity to run a nuclear power plant with all checks in place," said Ansar Parvez, chairman of the Pakistan Atomic Energy Commission which runs the civilian nuclear program. "As things stand, the performance and capacity of nuclear power plants in Pakistan is far better compared to non-nuclear plants." 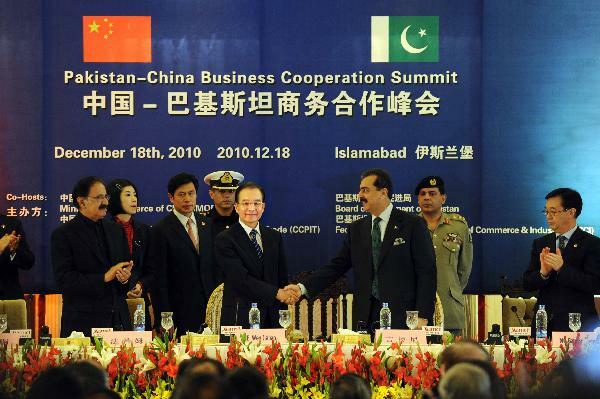 Please credit and share this article with others using this link:http://www.bangkokpost.com/business/news/418135/chinese-help-for-pakistan-comes-at-a-high-price. China on Saturday promised neighbouring Pakistan investment worth $42 billion, an official said, as Islamabad promised to help Beijing fight what it calls a terrorist threat in its far-west. Pakistan's Prime Minister Nawaz Sharif oversaw the signing of 19 agreements and memorandums mostly centred on the energy sector as he met Chinese President Xi Jinping in Beijing. Pakistan, a close ally of China, suffers from chronic electricity shortages and Islamabad has long sought investment in coal-fired power stations which it sees as a solution to the problem. Other countries have balked from such investments, sometimes on environmental grounds. The new agreements pave the way for Chinese state-owned companies to help build at least four new power stations in Pakistan, while the deals also cover the supply and mining of coal, the prime minister's press office said. "The deals being signed between China and Pakistan are worth $42 billion. The whole investment is being made by China," said Amir Zamir, spokesman for Pakistan's ministry of planning and development. "There is no loan or aid for the energy projects, but pure investment by the Chinese," he told AFP. Pakistan has for decades been China's closest ally in South Asia, and Beijing is a major trading partner and key supplier of military technology to Islamabad. Pakistan borders the far-western Chinese region of Xinjiang, which has seen a series of clashes and attacks on civilians that have left more than 200 dead in the past year. Beijing blames some of the region's violence on an organised terrorist group it calls the East Turkestan Islamic Movement (ETIM) seeking independence for the region, home to the mostly-Muslim Uighur minority. Many analysts doubt that any large scale organisation of the kind exists, while rights groups blame the violence on what they call the repression of Uighur language and culture by Beijing. Sharif told Xi that Pakistan would "resolutely fight the East Turkestan Islamic Movement terrorist force," China's foreign ministry said in a statement following the meeting in Beijing. "We stand behind China on all the core issues like Taiwan and Tibet to human rights, the fight against the ETIM," Sharif added within earshot of journalists. Xi was forced to cancel a planned trip to Pakistan in September due to anti-government protests in Islamabad. But the Chinese president visited Pakistan's arch-rival India the same month, signing a raft of deals. Sharif acknowledged that "somehow the circumstances led to the postponement of the visit," adding to Xi: "I believe you will be visiting Pakistan very soon." BEIJING—A major textile producer in China has backed out of a high-profile deal for control of a Pakistani company. The stated reason: Banks in the Chinese company’s home province face such large loan defaults that they balked at lending the $62 million needed to complete the acquisition. The scuttling of the deal by Shandong Ruyi Science & Technology Group Co., which has investments around the world, is a further signal that stress is mounting in China’s banking system and that the days of easy credit in the world’s second-largest economy are drawing to a close. According to Masood Textile Mills Ltd.’s chief executive officer, Shahid Nazir, Ruyi in October pulled out of the deal to buy 52% of his company, almost nine months after committing to the acquisition. A spokesman for Ruyi couldn’t be reached, and the company’s Shenzhen-listed unit declined to comment. Credit from China’s state-owned banking system has in the past been readily available to companies with political backing and ambitions explicitly in line with those of the central government. Ruyi has received well-publicized visits from President Xi Jinping and Premier Li Keqiang and is expanding overseas, as Beijing has urged. As the economy slows, however, the vast expansion in bank loans used to help keep growth humming over the past six years is now being followed by rising defaults. China’s financial system is opaque. Authorities have been reluctant to publicize defaults, often swooping in with bailouts at the last minute. But nationwide, cracks are starting to appear. In the third quarter, the aggregate deposit base of China’s four biggest banks declined after years of robust growth. Since September, the central bank has pumped hundreds of billions of yuan directly into the country’s biggest financial institutions in an unconventional move to give the banks the resources to continue to support an economy that has grown dependent on borrowing.